Set to start filming in July, Damian Lewis’ next project, Billions, pits a US Attorney (played by Paul Giamatti) against a sketchy hedge fund manager (played by Damian Lewis). The role affords DL again a chance to play a character he seems born to play: the unconventional hero, on the wrong side of what is thought of as conventional good behavior. Damianista posted extensively of the stellar cast as it was announced in March. So here’s what we have for Damian’s Bobby Axelrod: A wife and kids, another woman of interest, an attorney on his heels. And for Damian himself: creator and co-producer Brian Koppelman tweeting his standing ovation Damian’s last day on the set of the pilot, Showtime promptly picking up a full season of episodes, trust exercises on set where Damian clearly does not let co-screenwriter David Levien down. All of this speaks to Billions being a must-watch series when it airs early next year. We know that DL has always been a stickler for researching his roles. His turn as Bobby Axelrod is, of course, no exception. So shall we look at some research we’ve seen him doing for the role? Yes, we shall! Money: we all know what it is, primarily from knowing when we have it and when we don’t. Not many of us can say we know how it works. Once upon a time, the US dollar had silver and/or gold behind it; that is, a rare commodity worth something real due its rarity. But the dollar hasn’t had a tangible commodity behind it in years. So where exactly is the value in our muddy green pieces of fiber-paper? Who decides its value? And if property and investment and world markets all seemingly revolve around the dollar, where is their value? The world of high finance seems such a foreign world, with a language accessible only to the select few with the power to move the chess pieces on the board. Even those “experts” who push the buttons to make the trades that drive the market are apparently at a loss to explain just what it is they do. And when glitches happen and the market hiccups as it did during the subprime mortgage crisis, we all feel the outcome even when we are helpless in understanding or explaining just what happened. Judging from Damian Lewis’ reading material these days, he may be searching for that necessary “Idiot’s guide to how money and the world of high finance works” still missing from the pantheon of how-to manuals. During the filming of the pilot in January, our Englishman in New York was spotted walking the streets with a well-worn book in his hand. That book was Fooling Some of the People All of the Time: A Long, Short Story by David Einhorn, founder of the New York hedge fund Greenlight Capital. Who better than a real life hedge fund manager to inform Damian’s process in getting inside Bobby Axelrod’s raison d’etre. More recently, a few weeks ago, DL was spotted with a book upside down in his pocket outside Wyndham’s Theatre in London. Being a fan who takes fandom to a forensic level, I searched high and low for what this book could be (well, I prodded Goodreads and Yahoo Answers to be exact) and had no luck. In steps Twitter, as it is wont to step in just when you need it most. 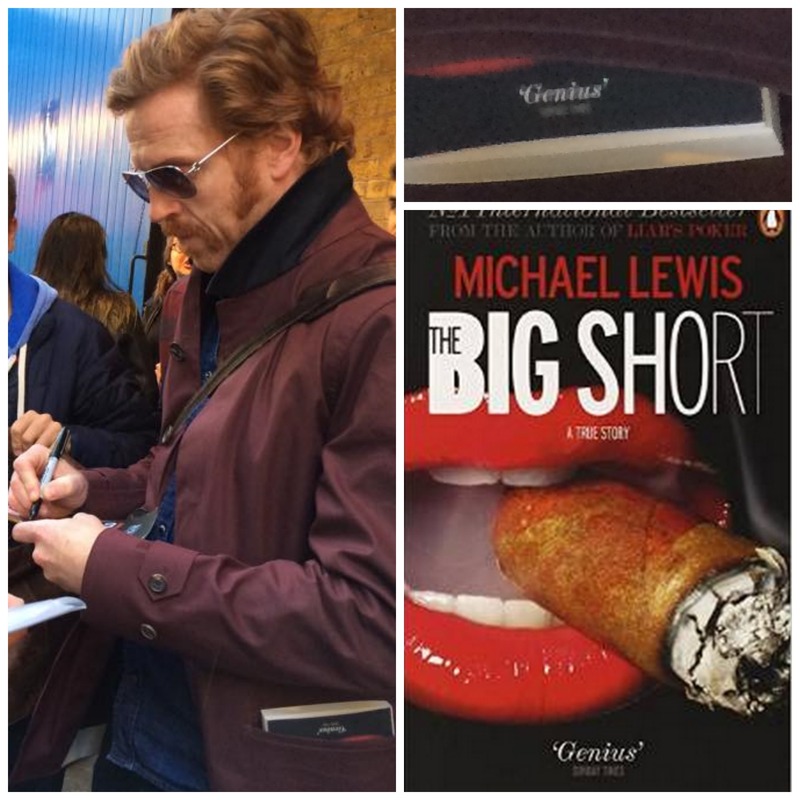 Helpfully, an observant tweeter shared that she had witnessed Damian Lewis reading The Big Short on the tube. And ta-da. I promptly put a library hold on this most recent of his reading. What fun to read what he’s reading at the same time he’s reading it, I thought. While waiting for the hold, I picked up another Michael Lewis book that happened to be on the shelf of new non-fiction and dealt with a similar topic. Flash Boys is a terribly readable tale about the birth of high frequency trading and how it lead to various nefarious high jinks on Wall Street. Lewis writes the dry topic of high finance like it’s the stuff of thrillers. So while his work isn’t high literature and can be a bit simplistic in the ways he assigns such remarkable agency to a small posse of individuals who played roles, good and evil, in what happened on Wall Street in the early 2000’s, his writing is highly accessible. (Or, perhaps, it really was that easy to rob American investors blind?) Tune in for more about Lewis’ (and Lewis’!) The Big Short when I sink into it. So, couple Damian Lewis reading Michael Lewis with the fact that financial journalist Andrew Ross Sorkin is lending a hand in the script for Billions, I sense we may be in for an authentically written and knowledgeably performed engaging story of high drama on Wall Street. As I am a day trader now, and have worked on Wall Street since 1988, I will be very curious to see how Billions portrays the world of high finance. I know that in order to make a show entertaining, writers have to embellish (and sometime just make up) story lines based on real world doings; but I am always concerned that viewers will take these stories and believe that all hedge fund managers are greedy, evil people. They are not. There is good and bad in every profession. I’m hoping that Billions shows that the world of Wall Street is not black and white or good versus evil. For the most part, it is hard working people who try to keep the economy of this country flowing. Thank you for reading my post and for your comment. Judging from all the people involved in this project, it sounds like they will do their best to cover all the bases. Damian was going to refuse Homeland if the script was going to paint all Muslims as terrorists. Odds are high that he did the same here…he wouldn’t play a hedge fund manager if all hedge fund managers were painted as evil. He’s not really interested in black and white stories and black and white roles. The research he does, the depths he goes to to understand his characters speaks volumes on what he wants to bring to this project. The rest of the crew are pretty formidable too. Yes, I think it will be entertaining and dramatic. But I don’t think it’ll be insulting to any one group of people. I’m looking forward to it too! Just wish it was on already!! I’ll be on the look out here in NYC for filming! Hi Lisa! Thanks so much for your comment. I remember our conversation about this on Twitter, too — yes of course every profession, mine, yours, and all others’, has its good, bad and ugly. I think the success of the new TV shows is how they give us characters in the “gray” area — they make you think all the time about whether this guy is bad or not, I think Billions will have a similar approach wandering in that gray area all the time making us think think think. The show has an amazing trio in the exe-prod seat — Koppelman, Levien and Sorkin are all very smart guys and I think, especially the presence of Andrew Ross Sorkin, ranked as most influential financial journalist second time in a row, on board would lend a hand to keep the series as realistic as possible. I am as curious as you are, and it would be great to hear your feedback once Billions is on our screens! I can’t wait to discuss the show the next day with you! It will be great. Also, Andrew Ross Sorkin is the co-host of the morning financial show on CNBC that I watch every morning. I’m hoping that DL will be on the show to promote Billions. If I hear of that, you’ll be the first to know! Oh, definitely! We will write episode recaps, and it would always be wonderful to have some expert feedback on the blog – how exciting! Oh, it would be wonderful to have DL on the ARS show and now that you are saying it, I can imagine it happening – we will have lots of fun, I just cannot wait, Lisa! Cheers! Previous Previous post: Let’s Help Sohana Beat EB!